In this stage we shall move on to handle the Purchaser’s view of the application. The purchaser’s job is to review requisitions, to get quotes for prices and to issue Purchase Orders (POs) for the items specified in the requisitions. The purchaser manages a list of suppliers to whom the relevant POs are issued. Managing the list of approved suppliers – Including the import of a list of suppliers from an Excel spreadsheet. Managing the list of POs. Each requisition may result in the purchaser issuing multiple POs to one or more suppliers. On completing the previous stage, we included in the sample project a new Purchaser perspective with a basic Manage Suppliers view, which manages a Suppliers database table and already implements the display in a table and the addition of new suppliers. This stage’s modeling should be performed in the Tutorial 9-10 project, you imported at the end of the previous stage. In most organizations, some data is maintained by certain officers on their PCs, using a spreadsheet program such as Excel (or in an application that can output/export Excel files). For the sake of this tutorial, we shall assume that the purchaser in our organization has been maintaining the list of approved suppliers in a spreadsheet. 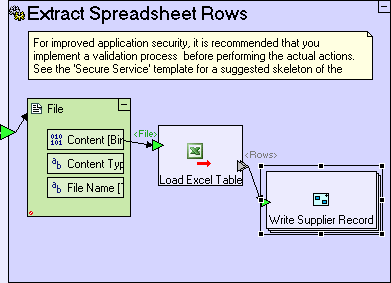 A sample spreadsheet, Suppliers.xls is provided in [tersus root]/workspace/Tutorial 9-10. The data in the spreadsheet should be imported into the Suppliers database table which is already modeled. Zoom to the Manage Suppliers view. Add Display/Button next to Add Supplier. Name it Import Suppliers Data. Zoom into it. Add Display/Popup. Name it Select Suppliers Spreadsheet. Zoom into Select Suppliers Spreadsheet. Add Display/Row. Name it File Row. Zoom into it. Add Display/Label. Name it File:. Add Display/File Input Field. Name it File. Zoom to Select Suppliers Spreadsheet/Footer. Rename the OK button to Import. The File Input Field (File) contains a default <Value> data element (of type File) which is needed in order to manipulate and extract the contents of the file. Save your work, and view the application in the browser. Click on the Purchaser perspective tab. Press the Import Suppliers Data button. Notice that a File Input Field is actually implemented in the browser in two parts: a text edit which contains the file name which may be manually entered, and a Browse… button, which allows the user to navigate his local file system, and select the file to import. Now that we can select a spreadsheet file to import, let’s model the actual import process. Zoom to the Import button. Add an ancestor reference of the Select Suppliers Spreadsheet popup. Add a Basic/Service ( ). Name it Extract Spreadsheet Rows. Add a Trigger to it. Add flow linking Select Suppliers Spreadsheet/Row/File/<Value> to the Extract Spreadsheet Rows trigger. Note that we are using a new type of process template, Basic/Service ( ), for Extract Spreadsheet Rows, instead of the usual Basic/Action. The fundamental difference between a Service and an Action is that the modeling inside a Service, will always execute on the server-side, whereas Action models will switch dynamically (and transparently) between Client and Server as required by the different templates used in the model. There are however certain modeling scenarios, such as the modeling we are about to perform, which must explicitly be defined as executing on the server-side. For more information, see Stage 13. Zoom into Extract Spreadsheet Rows. Add a Data Types/File data structure ( ). Add flow linking the Extract Spreadsheet Rows trigger to the File data structure. Add a Miscellaneous /Load Excel Table template ( ). Add flow linking File/Content to Load Excel Table/<File>. You may be thinking that the modeling we have so far performed in the Import button is unnecessarily complicated, and can be simplified by directly passing Select Suppliers Spreadsheet/Row/File/<Value>/Content to Load Excel Table/<File>. We have modeled as we did, due to limitations imposed by the browser, which does not allow access to Content directly. The File data structure must be passed to the server as-is, in order for Tersus to be able to extract the binary content from it. 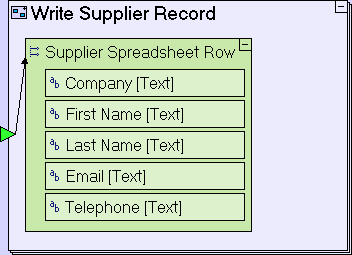 The data appears in the Suppliers sheet, and is formatted in a tabular format, where the first row defines column names (Company, First Name, Last Name, Email, and Telephone) and subsequent rows contain supplier information (one per row). Load Excel Table will search for data in the first sheet by default. If the required sheet is not the first one in the file, you may specify the sheet using the optional <Sheet Name> trigger (available through right-click -> Add Element). 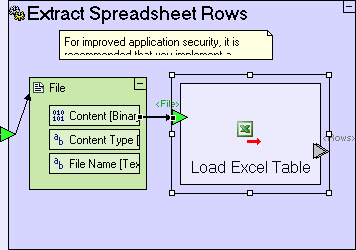 The Load Excel Table process still needs a definition of the way the relevant data in the sheet is structured. This definition is provided in a similar fashion to the Find template (discussed in a previous stage) – by deducing the data structure from the target of its exit, <Rows>, as we will see in a few minutes. Zoom to Extract Spreadsheet Rows. Add a Basic/Action. Name it Write Supplier Record. Add a Trigger to it. Add a flow linking Load Excel Table/<Rows> to the Write Supplier Record trigger. Right-Click on the Write Supplier Record process, and check the repetitive option. Zoom into Write Supplier Record. Add a Data Types/Data Structure ( ). Name it Supplier Spreadsheet Row. 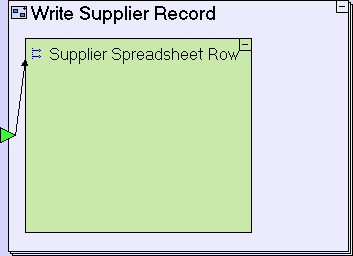 Add flow linking the Write Supplier Record trigger to Supplier Spreadsheet Row. Recall that in a previous stage we mentioned that a Data Structure and a Database Record are practically identical, apart from the fact that the latter is automatically mapped to a table in the database. Zoom into Supplier Spreadsheet Row. Add a Data Types/Text. Name it Company. Add a Data Types/Text. Name it First Name. Add a Data Types/Text. Name it Last Name. Add a Data Types/Text. Name it Email. Add a Data Types/Text. Name it Telephone. Zoom to Write Supplier Record. 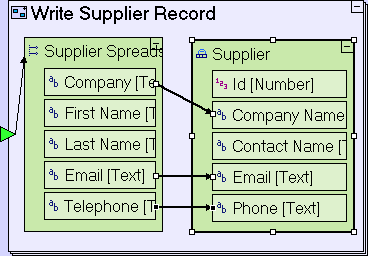 Reuse the Supplier data structure from the repository/outline (find it in Manage Suppliers view/Supplier List table). Id – A unique identifier for each supplier. Contact Name – The Supplier record has a single field for storing the name of the contact person as opposed to the spreadsheet where there are two fields, First Name and Last Name. Therefore Contact Name should store the two fields joined together. Reuse Supplier Id by dragging it from the repository/outline. Add flow linking Supplier Id/<Next> to Supplier/Id. Add a Text/Concatenate template ( ). Create a flow linking Supplier Spreadsheet Row/First Name to Concatenate/Text 1. Create a flow linking Supplier Spreadsheet Row/Last Name to Concatenate/Text 2. Add a Constants/Text. Press [Space] once to create the “ “ constant, and create a flow linking “ “ to Concatenate/<Separator>. 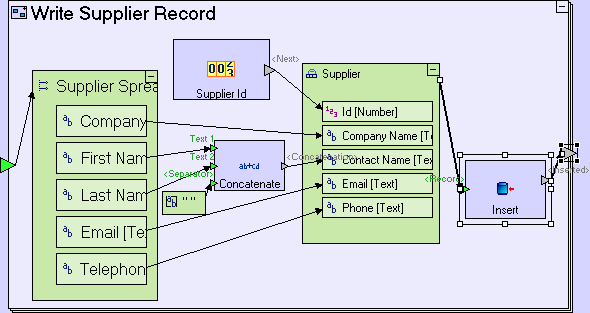 Create a flow linking Concatenate/<Concatenation> to Supplier/Contact Name. 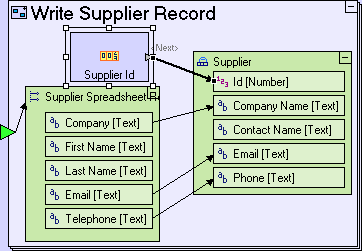 Insert Supplier records to the database. 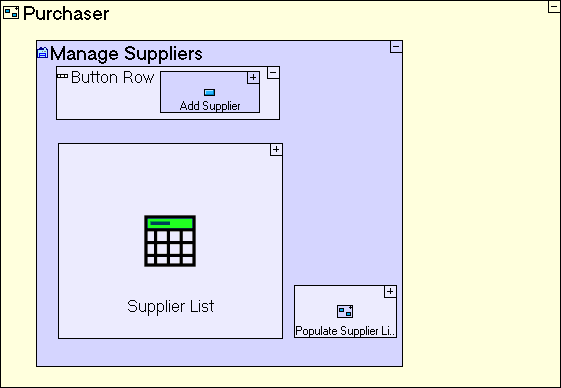 Refresh the Supplier List table in the Manage Suppliers view. 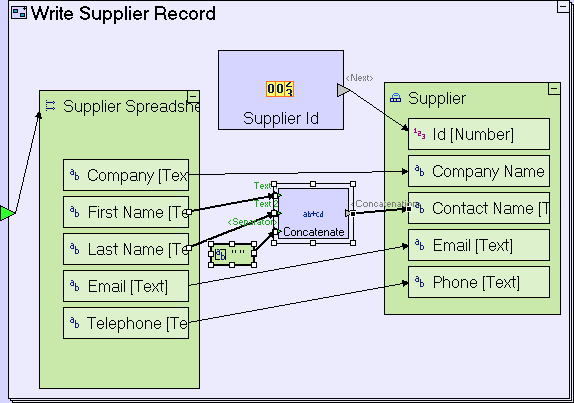 Create a flow linking Supplier to Insert/<Record>. Add an Exit to Write Supplier Record. Create flow linking the Insert/<Inserted> exit to the Write Supplier Record exit. Zoom out to Extract Spreadsheet Rows service. Add an exit to the process. Create a flow linking the Write Supplier Record exit to the Extract Spreadsheet Rows exit. Zoom out to Import button. Add a Display Actions/Close Window template. Add a Control trigger (through right-click->Add Element or by simply adding a trigger). Link the Extract Spreadsheet Rows exit to the trigger of Close Window. Reuse the Refresh Supplier List process (used in Add Supplier button/Enter New Supplier popup/Submit button) by dragging it from the repository/outline. Link the Extract Spreadsheet Rows exit to the trigger of Refresh Supplier List. The Validation view is the interface to a built-in utility, which checks your models and notifies you of potential problems). By default validation is run on every save, but you can run it independently, without saving, by switching to the Validation view and clicking the Validate ( ) toolbar button. Click on the cell containing Extract Spreadsheet Rows (in fact you can click on any of the cells except the one in the Ignored column). 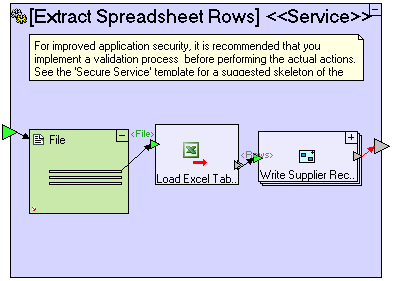 The validation warning is caused by the fact that the flow arrow starts at a repetitive element (the exit slot of the repetitive Write Supplier Record process) but terminates at a non-repetitive element (the exit slot of the Extract Spreadsheet Rows process), as descibed in the Details column of the Validation view. This issue is designated a warning rather than an error, because in some modelling scenarios this is actually the intended modelling. 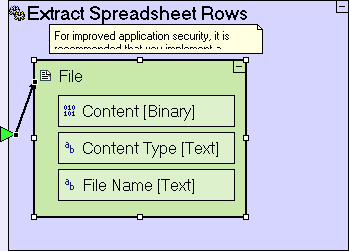 Indeed Extract Spreadsheet Rows is one such case, therefore it should simply be ignored. Click (again) on the row in the Validation view, to make sure it is selected. Click the Ignore selected warnings ( ) toolbar button. 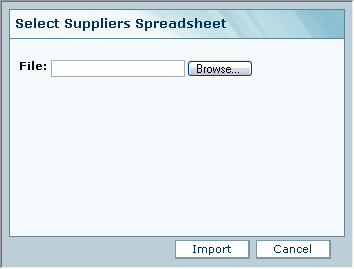 In the Select Suppliers Spreadsheet popup press the Browse… button. Navigate to [tersus root]/workspace/Tutorial 9-10 and select Suppliers.xls. Import the sample project Tutorial 10-11 and use it as the basis for the next stage of the tutorial. You may now proceed to Stage 11, in which we shall model a table display using a different technique which provides better control of its content.